Hudson River Community Sailing’s (HRCS) sixth annual Sailing for Scholars fundraising gala and regatta, held in New York, NY in October, was the largest and most successful yet. Headquartered at the Pier 66 Boathouse in Manhattan’s Hudson River Park, the non-profit organization develops leadership and academic success in underserved New York City youth through sailing education, and provides maritime education and recreation to the community at large. The gala was held in the Model Room at the New York Yacht Club on West 44th Street on Thursday, October 15. Sailors on 15 J/24s participated in the regatta on Saturday, October 11. 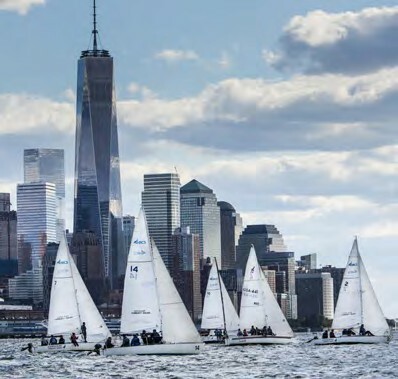 The events raised more than $120,000 for Sail Academy, HRCS’s flagship program, in which the organization partners with eight New York City high schools to offer academic credit to students by teaching science, math, and job skills through sailing. HRCS is also launching its Veterans Program, which will introduce members of the armed forces to sailing and involve them in the community, and has plans to expand its education program this winter and into 2016, targeting new schools and more students. For more information, visit hudsonsailing.org.